Artistic growth is a good thing. Had the Beatles stayed with "She Loves You" and never moved to "A Day in the Life," they might be viewed with as much regard as the Backstreet Boys in the annals of popular music. I tend to like bands that change over time, assuming, of course, that it is for the better. Coldplay is a very capable band that is pushing its envelope. Following 2002's "A Rush of Blood to the Head," they made a decent follow-up ("X & Y") that kept much of their style while allowing their guitarist more room in the audio mix. By itself, this isn't a bad thing, but if the rhythm section wasn't drawing enough comparisons to U2, overt copying of The Edge's singular guitar style threw the collection into a solid but unimaginative heap. Maybe it was a safe thing to do, but happily, they appear to be moving forward rather than recapturing their past. While "A Rush..." had possibly 8 songs that could fare well in commercial air-play, LaVida has one or two. Had Coldplay not been a proven brand, the stylistic differences beg the question whether this release would receive any airplay. And that's the risk of growth. 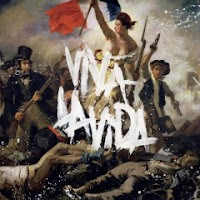 While not as radical a move as U2's "Zooropa" or Radiohead's "Kid A," they certainly seem less interested in delivering what was becoming a Coldplay formula; LaVida isn't commercial in a radio-ready sense, though no doubt they will earn tidy paychecks. It may not be possible for them to depart far enough from their core musical instincts to throw off their fans. Most of the growth here is by the singer/writer, Chris Martin. Like U2's Bono, he shares an ability to emote through his singing. Whereas Bono ultimately yielded to the sanctimonious temptations of the self-righteous, Martin remains a colorful interpreter of his message. What that message is isn't exactly clear. Songwriters quite often write snippets of lyrics that leave it to the audience to sort out. That's fine and often rewarding. Here, I can't point to more than a couple songs and say clearly, "this is what it is about." But by joining snippets, it's clearly a spiritual development, though the end is still uncertain. But I’m just so tired of this loneliness. Musically, the audio space is much more congested than previous releases, with an emphasis on string sections. This isn't always for the best, as they tend to overemphasize the dramatic tendencies in Martin's singing. That said, it's also likely to continue to be part of the band's sound. Other notable differences are the trademark electronic sounds added by producer Brian Eno and, to an extent, Martin seeking new ground by singing at a lower key than his typical range and falsetto. Overall, this is their most interesting CD to date, and there's enough here to suggest their best may be yet to come. Suggested Tracks: "42," "Viva LaVide," "Cemeteries of London"